The genres of fashion, portrait, art and landscape photography collide in an exhibition of Erik Madigan Heck (b. 1983) at Staley-Wise Gallery. They are tied together by the central presence of fashion – shaping each composition by a distinct relationship to colour, pattern, pose and garment. In most cases, though, the faces are obscured – whether by the subject’s stance or various pictorial elements. This strikes the viewer from the first room, which features large-format photographs of women with their backs turned. Colour delivers another punch, highly saturated and jewel-toned, popping off of the white walled gallery space. Muted, soft imagery seen in The Blue Hat (2007) – a play of silky, sheer fabrics, and a delicate patch of skin – counter the high-contrast colour palette of the majority of the show’s photographs. In The Red Socks, Old Future (2014), for instance, a hunched over figure dominates the picture plane, a sea of white save her red socks and deep blue ground. Colour also constructs the flat, minimalist forms and compositions that are so central to Heck’s oeuvre. In the Without a Faceseries (2018), the eye narrows in on oversized globular hats and sculptural garments by Giorgio Armani and Junya Watanabe, in blocks of both monochromatic colour and pattern. In these and other examples, the body is effaced as garment embeds itself in the wider pictorial whole. In two 2015 images from Harper’s Bazaar, Queen of Heartsand Florals, Heck manipulates his image in digital postproduction and applies red and black paint splotches and red and pink petals respectively, so that garments’ patterns appears to spill out onto the white ground. Conversely, the dressed body camouflages against nature’s immensity, or abundance in his epic photographs set in lush colourful landscapes. In both his studio and on-site photographs, Heck fabricates dreamlike worlds, in which onlookers may insert themselves through fashion. The various ways in which Heck positions the body also connects back to historical painting and portraiture, from Saskia in Comme(2017) much like a study of white-on-white in the canon, to Without A Face (Dior),which evokes a turbaned Vermeer sitter. Elsewhere, poses transport us to the golden age of fashion photography: Floralswith its model’s sloped shoulders and stylised hand-on-hip pose, her long sheath elegantly silhouetted against the white ground, quotes 1950s posturing. Meanwhile, the quiet stillness that reigns in these highly constructed images is disrupted momentarily in a picture of Kristen Owen published in MUSEin 2014, in which the movement of her turning, twisted body is accentuated by the black and white striped pattern of her garment. Through this show, Staley-Wise Gallery, which specialises in the classical and glossy work of “masters of fashion photography,” according to its website, made a point of including Heck in that group. 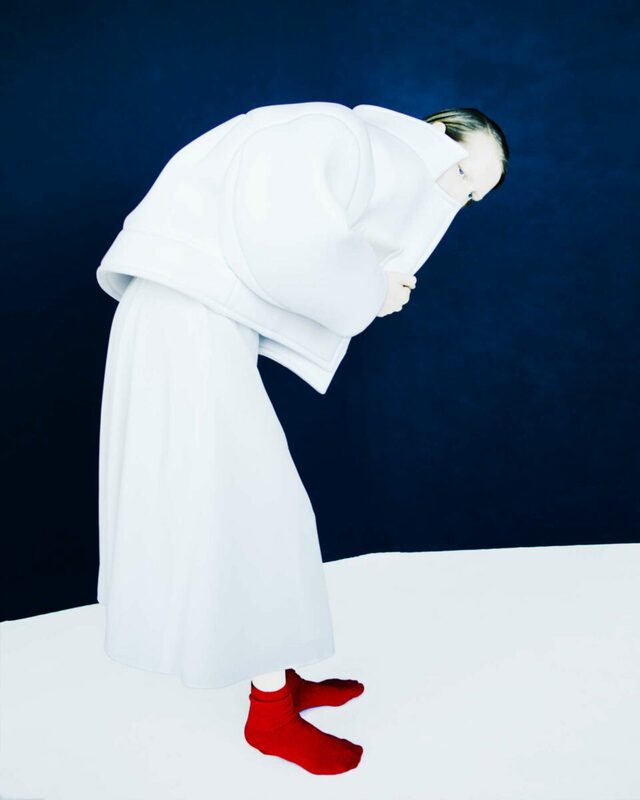 Erik Madigan Heck is at Staley-Wise Gallery, New York, until 18 May. www.staleywise.com. Lead Image: Erik Madigan Heck, Giorgio Armani, Without A Face, 2018 © Erik Madigan Heck / Courtesy Staley-Wise Gallery, New York. The Age of Abstraction: Women Artists includes various pieces from artists Sonia Delaunay, Gillian Ayres and Tess Jaray. Delaunay was the first to create something new – a “visual language”. Fashion and Freedom at the Manchester Art Gallery sees established designers present works in response to the social changes women went through in WWI. The subject of drugs in art is a longstanding tradition. Jac Leirner’s solo exhibition at White Cube Mason’s Yard takes a simpler approach to dependence.